Here’s the perfect little take-along for your light-storage needs. 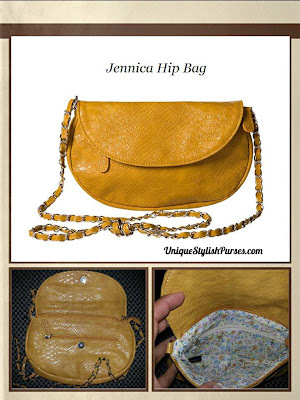 Big enough to carry your wallet with ease, this delightful Jennica Hip Bag is also sassy enough to impress your friends. It features Dijon-yellow faux snakeskin design with unique matching long strap with silver chain woven accent. And you’ll love the delicate abstract floral print interior lining in shades of yellow, pale blue and magenta. Zippered inner and outer pockets; zipper and snap-closure. Bag is completely self-contained—it is not interchangeable like our traditional bags. Dimensions: 5 ½” tall x 9 ½” wide, with a 2” gusset; handle is 55” long x 3/8” wide with a 26 ½” handle drop.